Galileo Galilei was born in 1564 in Pisa , Italy, where he lived until the age of 11 and received his early education. His family then moved to Florence where he attended school at the monastery at Vallombrosa. Galileo later returned to Pisa to study medicine but never received a degree. He then studied mathematics first formally and then privately. He was ultimately appointed to a chair in mathematics at Padua in 1592 where he remained until 1610. Galileo's academic interests were diverse covering the disciplines of Mechanics, Astronomy, Mathematics, Optics, and Natural Philosophy. It is not the purpose of this summary to chronicle the life and works of Galileo as there are many excellent references on the "Links" page of this website. 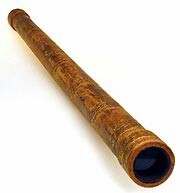 However, some of Galileo's observations with his primitive telescope were profound, and will be discussed below. 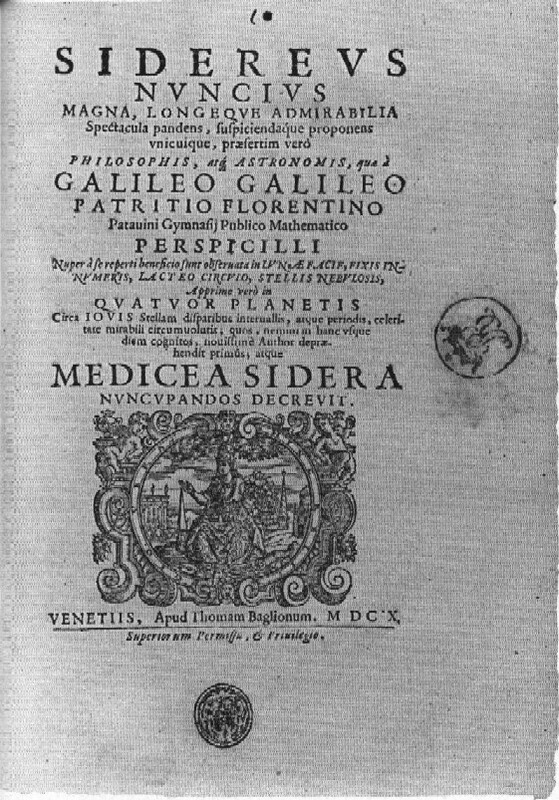 In 1610 Galileo published Sidereus Nuncius (The Starry Messenger). The book is not so much a scientific discourse on Astronomy, but rather a summary of observations that proved Copernicus' Heliocentric Universe to be fact. 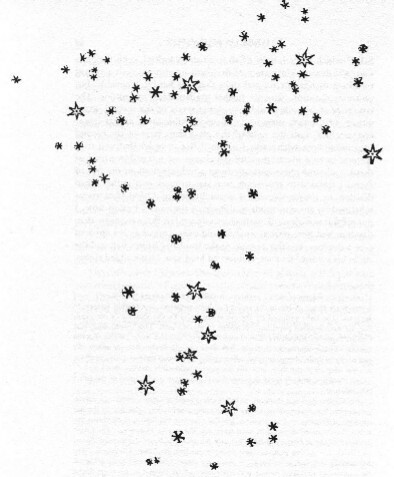 The observations of stars in seemingly dark parts of the sky - Galileo carefully explored the night sky. He quickly found that the "dark" parts of the sky were indeed filled with stars that were too dim to be seen with the naked eye. Clearly there was far more to the content of the Universe than previously suspected. Observation of Jupiter and its Moons - Some of the most profound observations of Galileo were the motions of the moons of Jupiter. Galileo reasoned that if planets could orbit Jupiter, then the Earth could orbit the Sun. Possibly the most compelling argument Galileo made in favor of the Heliocentric Universe of Copernicus was based on the observations of Venus. 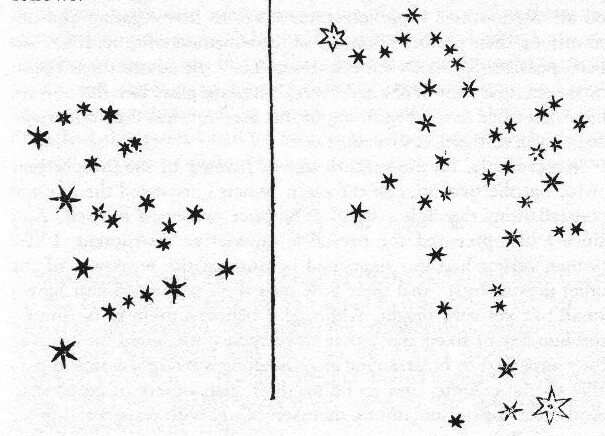 Galileo observed the phases of Venus throughout the year. At times Venus presented a small but circular disk and at other times a large crescent. 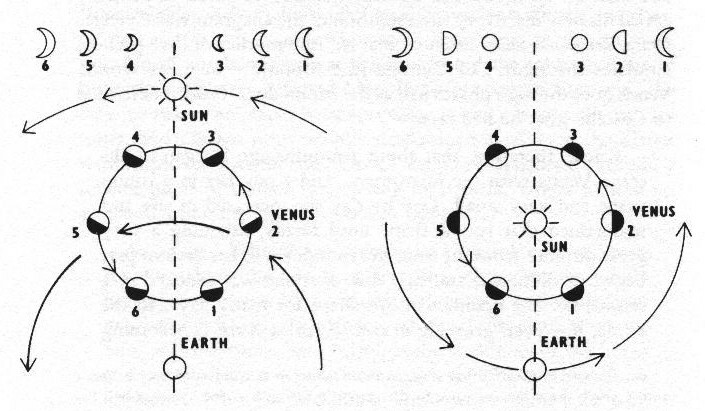 Based on these facts as illustrated in his drawings in Sidereus Nuncius, Galileo reasoned that Venus must orbit the Sun; proof of the Copernican Universe. In 1609 Galileo Galilei heard of new invention by a Dutch optical maker that magnified distant objects. Within months Galileo had crafted his first telescope and turned it toward the sky. His observations were profound, shaking the very foundation of science and religion. By March of 1610 Galileo had written a discourse on his initial observations, which was published as Sidereus Nuncius (The Starry Messenger). Other publications soon followed with descriptions of mountains on the Moon, spots on the sun, bodies in orbit around Jupiter, the phases of Venus, and visions of stars where none appeared to the naked eye. Galileo, with this simple tool, transformed our understanding of the Universe. By the end of the 13th century, craftsmen in Europe had developed magnifying glasses and had even mounted these lenses in frames to be worn on the face. In late 1608 Dutch spectacle makers mounted these lenses in combination and the telescope was invented. Galileo heard of this invention in 1609, and by the end of that year he had crafted several versions including the telescope that made the critical observations reported in Sidereus Nuncius. Galileo's original telescope had a 37mm diameter plano-convex objective lens with a focal length of 980mm. The original eyepiece was lost, but according to Galileo's writings was plano-concave with a diameter of about 22mm and a focal length of about 50 mm. These optical characteristics allow us to use a few simple formulas to calculate the powers of Galileo's telescope including the light gathering area, the light gathering power, the magnification of the telescope, and the focal ratio. LGP = (37/5)2 = 54.8. Therefore Galileo's telescope gathered about 55 times more light that the eye.